What's This 2012 Doomsday Psychology? 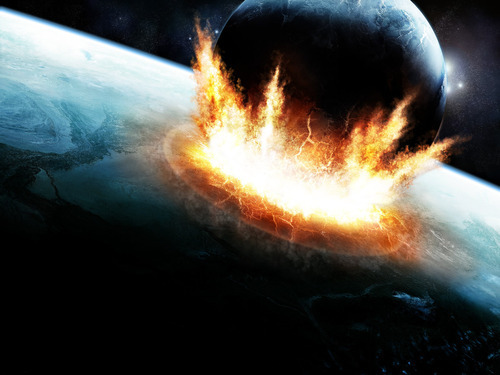 Millions of Chinese, Russians and Americans Believe the End of the World Is Nigh! 4. Massive earthquakes and tsunamis caused by planetary re-alignment and expansion. NASA has been aggressively seeking to dispel doomsday fears. It says there is no evidence that Nibiru exists, and rumours it could be hiding behind the sun are totally unfounded. The space agency has also rejected apocalyptic theories about unusual alignments of the planets, or that the Earth's magnetic poles could suddenly "flip" to cause calamity. Conspiracy theorists contend that the American space agency is involved in an elaborate cover up to prevent panic. Dr David Morrison, a senior astronomer at NASA, said: "At least once a week I get a message from a young person, as young as 11, who says they are ill and/or contemplating suicide because of the coming doomsday. I think it's evil for people to propagate rumours on the internet to frighten children." What Dr Morrison forgot to mention is that it is not such a good idea to frighten adults either! As we approach the end of this year, millions of ordinary people around the world appear to have fallen for the myriad experts and self-styled prophets who continue to announce the impending end of the world either on the elegantly symmetric date of 12-12-12 or December 21st, 2012, the date that marks the winter solstice. Some inspired people are equally convinced that these magic dates afford a beautiful opportunity for humankind to begin the process of collective transformation; healing on a personal and global level; and to carry out a shift in the global perspective from Duality towards Unity Consciousness. We could be on the brink of discovering who is right! The Australian Prime Minister Julia Gillard has filmed a tongue-in-cheek video that says, yes, the Mayans were right and the world is really about to come to an end. In an attempt to exterminate the hysteria, the US Government confirms we will live past 2012 and the USA.gov website has published a blog post stating that "the world will not end on December 21st, 2012, or any day in 2012." The US government's decision to debunk the end-of-the-world myth is a tacit recognition that this issue is now ingrained in the collective consciousness of a vast number of American citizens. The issue with December 21st, 2012 and the predicted disasters, that some think will happen, probably started with the so-called end of the Mayan calendar. Their calendar does not end on that date; it is just the end of the cycle and the beginning of a new one. "If the Mayans are right, I won’t pay my credit card bill," was one popular post on Weibo, China's version of twitter. The Chinese are now taking the date of December 21st -- the day the world is supposed to end -- seriously, with panic buying of candles across many counties. For example, people in two counties of the south-eastern Sichuan Province rushed to buy candles and matches as a rumour said the Earth would be shrouded in darkness for three days on December 21st when the legendary Mayan Calendar comes to an end. "Candles are selling by the hundreds, with buyers constantly coming to the market. Many stores have run out," according to the West China City Daily newspaper. The source of the panic was traced to a post on Weibo predicting that there would be three days of darkness when the apocalypse arrives. China has no history of preoccupation with the apocalypse, and the current wave of paranoia can be traced to Roland Emmerich's 2009 Hollywood disaster movie "2012". While the film received a somewhat lukewarm welcome elsewhere, it was a roaring success in China, as viewers identified with the plot that saw the Chinese military build arks to save humanity and demonstrated that the Chinese culture was ahead of the rest in its forward planning and foresight. Since the beginning of December, the word "Mayans" has trended on Weibo as millions of Chinese speculate that the end is nigh. Alongside "2012", Emmerich's other movies have also contributed to the collective sense of science-fiction catastrophism in global society via "The Day After Tomorrow", "Independence Day" and "Stargate." 5. Stocking up on just about anything one can imagine. People might be living next door to a prepper and never even realise it! Hundreds of thousands of Russians and Ukrainians have been stocking up on survival goods, including canned food, cereals and matches, ahead of the impending apocalypse. Russia saw people in Omutninsk -- Kirov region -- rushing to buy fuel and supplies after a newspaper article by a Tibetan monk confirmed the end of the world. In Tomsk, Siberia, storekeepers are selling “emergency kits” -- for about $30 -- that include food, candles, matches, soap, and even games. Novokuznetsk city faced a run on salt. Near the Altai Mountains panic-buyers snapped up all the torches and thermos flasks. Emergencies Minister Vladimir Puchkov said in a statement, "It has been proved conclusively that global catastrophes take place at intervals of between 10 million and 15 million years,” so there is no need to worry. Dmitry Medvedev, the Russian prime minister, addressed the doomsday situation thus: "I don't believe in the end of the world." Before adding somewhat whimsically: "At least, not this year!" At least one Russian official took a humorous slant on the doomsday matter: "The end of the world has already started in some regions. There is not so much as a minute of daylight in Murmansk or Norilsk," said Roman Vilfand, head of the meteorological service in Moscow. Failing to clarify that in these extreme northern latitudes, permanent darkness is as normal as the winter solstice in December! What are all these people so concerned about? Exactly why are there millions of Chinese, Russians and Americans feverishly preparing for doomsday? The truth is that people will never find two preppers that are exactly alike. Some are deeply concerned about the potential for natural disasters and believe that we are now entering into a time when there will be catastrophic Earth changes and others are concerned about the financial markets and the state of the global economy. High levels of anxiety are symptomatic of the rapidly evolving global civilisation in which the population, energy consumption and debt are growing exponentially as indeed is their toxic fallout.